Never break an expensive headlight or fog light again! The XPEL Headlight Protection Kit provides a durable, scratch-resistant film to cover and protect headlights and fog lights. The film protects lenses from rock chips and scratches, even at high speeds! A XPEL Headlight Protection Kit is available for hundreds of popular makes and models. Find your kit and get protected! Probably the most common issue seen with composite headlamps is the sandblasting caused by rocks, road salt, debris and sand. This pitting and cracking not only affects the appearance, but it also reduces the performance of your lights. In some extreme cases, more commonly seen with fog lights mounted near to the ground, this can actually cause the lights to crack, allowing moisture to form inside the lens. XPEL film is designed to protect from all of these elements. 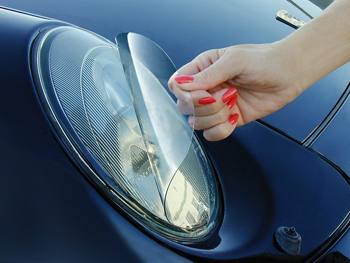 In fact, it can actually help restore lights that are showing signs of wear from pitting. Acting like a wax, the adhesive fills in the surface defects, creating a shiny consistent surface while protecting from any further damage. XPEL Headlamp Protection Film is non-yellowing and offers environmental resistance as well as super gloss retention and superior optical clarity. XPEL Headlamp Protection Film is laminated with a high performance acrylic adhesive, which has excellent adhesion on a broad range of surfaces. With the average cost of replacement head lamps and fog lamps spiraling to nearly $300, it is nice to know that there is a product available to protect your car against the perils of the open road. XPEL's Light Protection Kits are made from a proprietary, scratch-resistant, urethane material coupled with the strongest optically clear adhesive available. Designed for maximum durability, these light covers were originally tested under the harshest of circumstances with amazing results. Both in the real world and in the lab, our covers have proven that they will withstand a barrage of 1" diameter stones (about 1oz.) at speeds up to 120 m.p.h. with no damage to the lens they protect. It is nice to know that your expensive lenses are protected in every scenario. XPEL is so confident in their product that they offer a 7-year warranty to leave you with complete peace of mind. Installation of XPEL Headlight Protection Kits varies based on the type of headlights. You will need a hair dryer or heat gun, a spray bottle of water and 2-3 drops of baby shampoo or liquid soap, and the squeegee tool included with the kit. 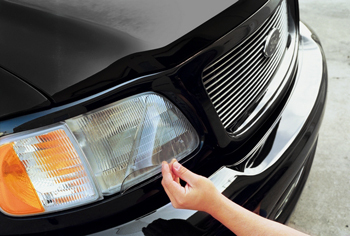 You must thoroughly clean the headlight lenses before applying the film. Please see the installation videos below. Complete instructions are included with the kit. Be sure to overlap strokes to avoid trapping air or solution under the material. Bubbles tend to form most often at curves and contours, so pay special attention in these areas. The material may be gently pulled back up in areas if necessary to reposition the kit, or if you find that you have trapped dirt, air or an excessive amount of solution under the material. Do not worry about small pockets of solution trapped under the material, as over time the solution will evaporate, making the spot unnoticeable. Air, however, must be removed. Any attempt to pull the material back up must be done within 10 minutes of application or excessive stretching will occur, so check the kit often for bubbles. If you accidentally stretch the material too far, you may end up with the kit overlapping the edges of the panel. Please enter your vehicle's year, make, and model into the form below. Please enter the sub-model if applicable. International and expedited shipping not available. Additional discounts are not applicable. A $12.95 shipping rate is applied to each shipment. The kit is perfect. Be sure to watch the "how to" video on YouTube. It was very helpful in avoiding poor fit. ProsProtection for expensive headlight covers. I've used it on my 8 year old car and the headlights have remained clear without crazing. ConsCan be difficult to smooth out wrinkles on the edges. Watch the video, it helps. This is the best thing for cars. My 2002 Camaro's headlights were fogged over and after cleaning them and putting the film kit on them; they are like new! Must have for those foggy headlights. The material seemed to be of a lighter gauge than the 3M plastic I installed on my Toyota 4Runner Ltd 2000. My 2011 has rather large headlight units with multiple compound angles and that presented some difficulty in getting all the pieces applied properly. With the help of a hairdryer it all laid down in the right places. I had my buddy help me and four hands are definitely better than two. These headlight units are quite expensive (I had to replace one once) and to spend $70 to protect them is money well spent.